O boy O boy the last few weeks have been so bizzy! And because Berry was keeping the laptop to herself for work, me was patiently waiting for her to move out of the way and tell you something about it. 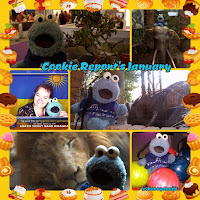 Well, if you have been paying attention to the Cookie Report Facebook page you probably saw some awesome things me have been doing lately. Let’s make a monthly weblog report to round up last month. 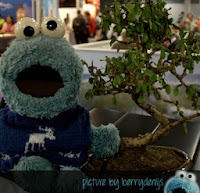 For her weblog – if you read Dutch just check out the link under the pictures – Berry went to the Holiday Expo (Vakantiebeurs). 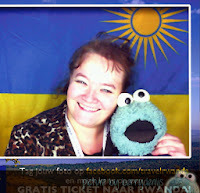 It is a big expo where all kinds of tour operators and such come together to show you the great things of the country or trip they are representing. Me had a blast. It felt like me was on Holiday already. We went to the Caribbean, Rwanda, South-Africa, New Zealand… and that all in just two days! Me felt like a giant in Asia, because of this tiny little tree… it is called a Bonsai. It was really fun. Berry and her dad – and me! 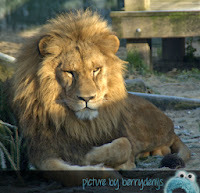 – went to the zoo to relax a little after a bizzy week. Berry had been under the weather for a while, so a little relaxation to recharge is always good. 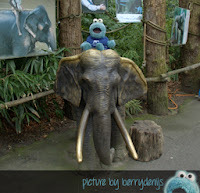 And me got to pose with some gorgeous animals at the zoo. Look at me and my rides. O boy O boy, me is just kidding. They are statues. Cool huh. 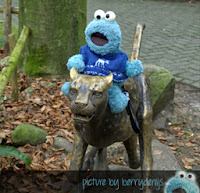 Berry was going to make a report about Stichting Leeuw in Anna Paulowna, North-Holland. This foundation takes care of abandoned big cats, like lions, tigers, mountain lions and panthers. Most of the animals are ex-circus acts. The foundation try to give them a better home and even is trying to find a new home in a reservation in South-Africa and Asia. Cool huh! Afterwards me and Berry grabbed a bite to eat before heading home. O, under the pictures there is a link to her Dutch article about the foundation. Well… this picture kinda says it all, don’t you think? Me went bowling. It been a loooooong time since me did that and because me paws could not fit in the holes of the ball, me tried to throw it differently. 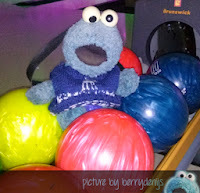 But Berry had to stop me, before me hurt meself… and eat all the bowlingballs! Is it just me, or do they look like giant candies? Yes! It had been snowing. Finally. 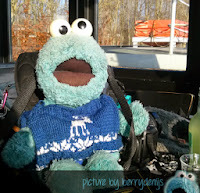 Berry and me were so happy, she grabbed me, put me on top of her camera bag in the car and we drove off into the white world to DierenPark Amersfoort, hoping there would be snow too to see the tigers play in the snow. Too bad there wasn’t that much snow over there. But we had a great time anyways. 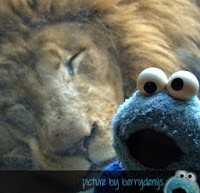 And me sure is glad the lion also sleeps during the day! Now me could sit real close to them against the glass. 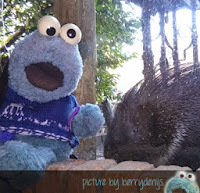 And these porcupines are so cute. They were nosey too, sniffing me out. We had a great day.